Small, pocket-sized HD cameras are becoming increasingly common and affordable. For less than $200 the options are surprising as the market for web-based video expands. Vloggers, first-time movie makers, and anyone who wants to capture everyday life and share it in HD need only find a camera that suits their tastes - for me, this was the Flip Ultra HD. As the 4th video camera in my current collection, what drew me to the Flip in the first place was that I was eager to shoot home videos. You might expect that with three other cameras this wouldn't be such an issue, but the truth is that it's tough to be spontaneous when carrying a full-sized camera around actually requires some pre-planned dedication. Portability is everything in this case. The video quality here is impressive given the size and price of the unit, although the Flip Ultra HD shoots 720p at 30fps (1280x720 widescreen) as opposed to the full 1080p. It comes with a rechargeable battery pack that can also be switched out with two AA batteries, and is otherwise charged through the USB port that pops out of the side of the camera. Shooting is kept simple and straightforward. The red button on the back starts and stops recording, and your videos are automatically kept track of given the time and date. There is a small zoom function, and basic navigation that lets you scroll your videos on the camera. You can also preview your recordings as you go on the 2 inch screen, which I actually found quite comfortable. Uploading is equally easy. Pre-loaded software helps catalogue your footage into folders by the month it was shot in, where you can then organize and export your footage as you please from your computer. Existing footage on the camera is then removed after capture to free up space for your next outing. Things to keep in mind during shooting is that given the small size of the camera, you'll experience a lot of shaking if you're moving around too much. Even with an image stabilizer, this is unavoidable with a small unit and you might want to consider using a tripod - there is a mount on the bottom of the camera. The Flip Ultra HD should be looked at as an entry level camera (and not an alternative to the full-sized cameras) as there really isn't any way to upgrade it. There's no mic jack (although it does record audio), no additional space for a memory card, and shooting features are at a bare minimum. 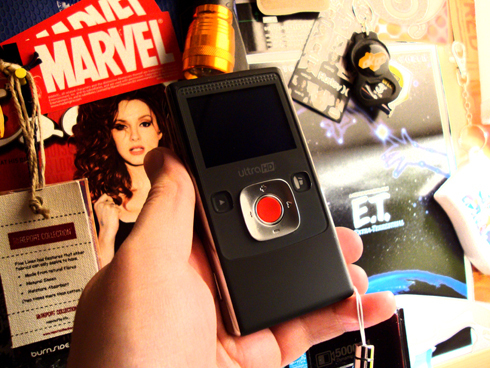 Still, it's an agile and fun little video camera that makes shooting simple and spontaneous. Not to mention, it's still a huge step up from what most cell phones are capable of. You'll find yourself more willing to take it out because you can hide it in your back pocket, and for the sake of sharing more with friends and family this is a definite plus. This concise unit is sure to make you rethink the way you shoot video or maybe even give you the courage to start doing it more often. 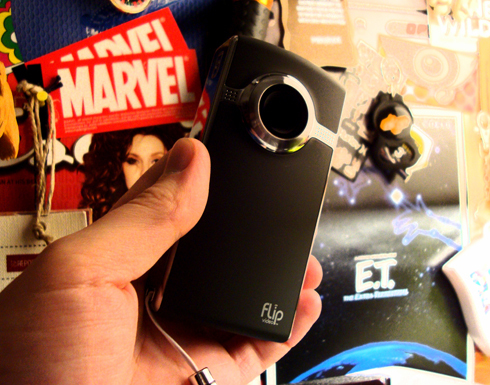 Throw the Flip HD in your pocket and have fun capturing your everyday adventures! Below is a Flip cam test that I shot while experimenting with how I could mount the small camera to various points on my Jaguar. The border around the video was added in post - more on this Flip HD test here. Congrats on the new camera! And great choice. I know with you the more portable the better, and this is about as good as it gets. I was hoping you would post a sample video with it, but I'm sure we'll see that soon enough! A sample video is on the way :) I'm going to be uploading a short video review of the flip HD as soon as I get a chance to edit it.